Figure 1: What Really Happened. Note the Roman Warm Period and Age Of The Dinosaur are not shown, neither is the great Submarine Warming Period and the recent 21st Century Ice Age. The alarmists are always banging on about risks to the climate. But they never risk their own identities, prefering instead to hide behind a cowardly system of net-anonymity. I use my actual name in everything I do online, I even publish how much I can bench press (300lb). I have hunted game in real life. I could if I had the chance kill a polar bear with a good rifle or my hands if it came down to it. And that's an important qualification in climate science. Any climate scientist who hasn't shot their own Polar Bear quite frankly doesn't understand the first thing about the out-the-lab realities of nature. Because I do understand the realities of nature it means I can avoid pointless labish "analysis". I can just cut to the chase by focusing on obvious real world self-truths passed down through time honored rumor fueled speculation. In what follows I will explain how recent global climate history drives nails into the coffin of manmade global warming at every turn. But first lets get one thing straight, I don't "do" dates when talking about history. For one thing the calendar is uncertain with missing days here and missing days there and competing theories (gregorian, julian etc) and so it would be biased to pick any one. Dates are unnecessary anyway it turns out. I can instead to reference history by temperature periods. So when I say "Medieval Warm Period" or "Little Ice Age" these define themselves and it's logically absurd to ask me to nail them down to a specific period of dates or to demand history to be chronologically consistant. Britain is too cold today for an army to invade it wearing skirts. But the Romans did exactly that. Furthermore the Romans could only invade places that could produce wine. Therefore it must have been a lot warmer globally in Roman Times. QE2. If it was warm in Roman times it was about to get a lot warmer. Without any help from man the Earth warmed up of it's own accord thereby disproving manmade global warming before Al Gore was even born. It was a very pleasant time for everyone on the planet. The weather was great and el vino did flow. People enjoyed a level of prosperity not seen again until co2 emissions were invented. It was so warm that the Northwest Passage opened, which allowed the Chinese to sail right into Europe . After a series of fierce, but pleasant, battles between the Vikings and Chinese in the warm oceans, the Vikings were victorious and claimed a newly thawed island as their own. The Vikings named this new island "Greenland" after the luciously co2-fed tropical forests that covered it. After years of prosperity caused by a very warm world, the climate decided to disprove manmade global warming again by cooling down on it's own. The world became grim and frostbitten. The temperatures in fact dropped down so far that it was even colder than the cold year of 2008 . Yes I know that is hard to believe, but all that global warming you were shovelling out your driveway last year was still not as cold as the Little Ice Age (but we are getting worryingly close and noone is doing anything about it). When the ice hit, it hit hard. European culture, which had thrived in the warmth of the Medieveal Warm Period has never truely recovered. Noone ever used castles again. The Hippo population in London was eradicated and people had to resort to selling meagre goods on the frozen Thames. Millions died in such frost fairs. The cold brought plague, famine and war. Napolean attempted to invade europe and Hitler was born at some point. It got so bad that in one year there was literally no summer as the sheer cold caused Earth to swoop through quarter of it's orbit in a single night. As for the Vikings, well they had thrived on Greenland during the Medieval Warm Period, but now it became cooler and mountains of ice started advancing into their towns and cities. The Vikings hastily renamed Greenland to Iceland and abandoned it as a lost cause. Someone once said something about remember the past or you will repeat it, I forget who but the point stands. What can we learn about the global climate history I have presented? Well to state the obvious first, history proves manmade global warming is a fraud. Man has never affected the climate in the short period of history I covered and therefore logically never could. We also know that temperature has changed dramatically in the past due to completely natural reasons. Couple this with the fact that the climate is a self-regulating machine that resists man's attempts to change it and we see that manmade global warming is disproven. As for risk what about the possibility that without the checks and balances of human "pollution" the dinosaurs might return? Have the alarmists even given that a moment of thought. We don't know how the dinosaurs died out and this opens up the possibility that it was due to a reduction in co2. Back in dinosaur times the Earth had much more co2. Plants were absolutely massive, carrots the size of small automobiles. Could the Waxman-Marxley bill cause a reduction of co2 that would produce carnivorous lizard-beasts the size of houses? As far as I know no so-called "scientist" has ever asked this question let alone answered it. Let me share with you an experience I had over the weekend at a local bar. It was getting late by the time I finally managed to turn the conversation towards blog science and the fraud of global warming. Most evenings the few remaining drinkers will just sit there in silence as I discuss climate science at length, no doubt admiring my knowledge and importance. But this week was different, a life-educated looking man suddenly interupted me with extraordinary insightfulness. "Listen", he told me, "I am not a climatologist but I have approched this from a different angle"
Facinated I reached for my scotch. "I am an engineer. Tennis rackets are my trade. I design, test and certify tennis rackets"
Finishing off my glass I gestured that he may continue. "I might know nothing about climate but I can analyze data and come to conclusions about climate anyway. I am an expert at how people miss-use graphs. Let me show you." He reached for his IPhone before continuing. 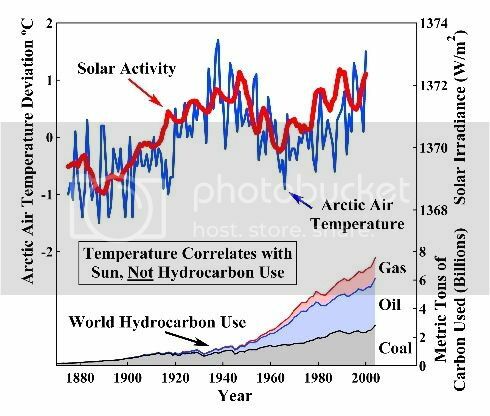 "The following is not a 'climatologists' study; more from the view of a tennis racket engineer who has spent a lifetime in data analysis/interpretation"
Image 1a, The graph I was shown in the bar which compares Hydrocarbon use, solar activity and temperature compared. "Hydrocarbon Use" being a technical term for prosperity. Notice how temperature moves up and then down and up again while solar activity goes up and then down and up again. Ie the same thing. In engineering this is called correlation (pronounced cor-rel-ation). Technically speaking the above graph proves global warming is caused by the sun and NOT by co2. I inquired where he had located such a powerful graph. "Found it on the internet", he replied. Well what this demonstrates is that you don't need to be a climatologist or know anything about climate to be an expert on climate. Why is it that so many engineers are skeptical of global warming? Well take tennis racket engineering, if you were to engineer a tennis racket incorrectly someone might recieve a bad wrist strain. On the otherhand if you peddle together a climate model incorrectly there are no bad side effects, but you will have dozens of grants falling through your letter box. Therefore obviously manmade global warming must be a myth. Update: I received a snarky comment (deleted), probably from a warmist, complaining that the graph shows arctic and not global temperature. Yes yes I am aware of this. No it wasn't a mistake, notice I never actually said the graph showed "global temperature" so I haven't made a mistake. Remember I have been given peer reviewed status by Prof. Malvolio who is an expert in metaphysics so I am hardly likely to make such mistakes. As for the claim that if global temperature is graphed instead of arctic temperature it no longer correlates with solar activity, remember the engineer explained it wasn't "a climatologist's study", he doesn't know anything about climate, he doesn't need to. What he did was look at graphs he found on the internet and come to conclusions on climate nontheless. He is an expert at data analysis and how graphs can be miss-used. Learn to read. Picture this if you can. It's Friday afternoon at the IPCC climate lab. Dozens of government funded climate scientists are hunched around a big computer frantically feeding in dodgy punch cards. They've had it easy the rest of the year, not even wearing their lab coats most of the time, but this week is different. The IPCC report is due out on Monday and they must get those warming projections as high as possible before release. They haven't been outside for months and by order of the administrator no windows are allowed so that noone can see outside. Some of them have left their sports cars in the open because their models said it would never snow again. It's snowing outside. Suddenly the phone goes. One of supervisors picks up the phone. There is a muffled voice of urgency at the other end. "Auditors?!" the supervisor exclaims in alarm, "From the Internet? ", "Here? ... Now?!". For a few seconds everyone in the room freezes. Then as quick as silence fell they begin scrambling around the room binning this and shredding that. Warmists of course think the above turn of events will never happen. They know the labs are defended by government red tape. Internet auditors like me would never be allowed to analyze one of these labs or look at the code. However now we are using the red tape against them. Through clever use of Freedom of Information requests and YouTube takedowns we are slowing them down. If a file is moved, did they tell us? Did they have authorization to move it? How was it moved? Who moved it? When was it moved? Why did they move it? Are the timestamps for the move accurate? Was the move logged? Who audited the logs? Who authorized the audits of the logs? Are the log authorizations audited? Just who is paying for all of this?? If we just hack away with these questions hopefully they will become so busy meeting our demands that they will miss the deadline for the next IPCC report. What we are looking for is strange file movements and procedures not met. This is what blog science is all about and we are doing it today. For Warmists I have 4 straight forward demands you must make for transparency and QA standards. If you do not comply I will report on your non-compliance and will also consider suing the IPCC. I hearby demand the IPCC rewrite it's climate model in a modern programming language such as Visual Basic or Java Script for auditing purposes. FORTRAIN is outdated and inadequate. 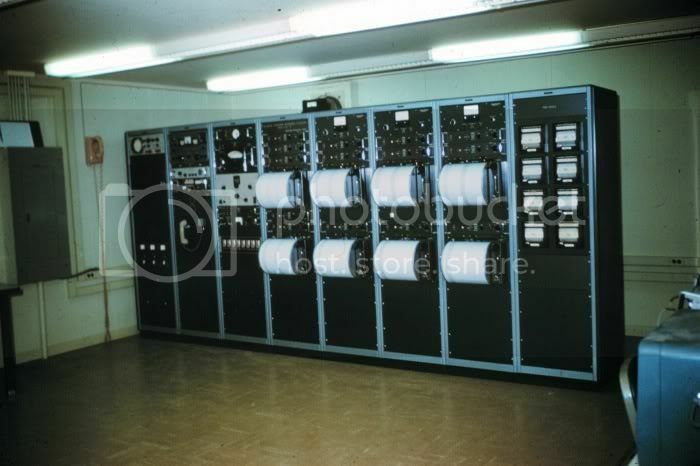 I hearby demand windows are installed in all exterior walls of IPCC computer labs to ensure climate scientists can properly observe the cold global temperatures and failing crops everyone else is seeing. I hearby demand all data files held on IPCC computers are released immediately to wordpress and blogspot. I hearby demand temperature records are unadjusted immediately. Please satisify all further demands posted by readers in the comments. Remember if you don't meet these demands I may very well sue the IPCC.